Submission of a manuscript is considered subject to the understanding that the manuscript is original and has not been published before in any form and is not being considered for publication elsewhere. Due to a large number of submissions, at least for now, we are aiming to proceed only with articles falling in the top half of our normal range. The editorial board will have an initial review to decide whether a submission should be seriously refereed. To speed up our review process, you must choose an associate editor whose area is closer to your submission. Form of Manuscripts should be written in English, clearly typed, with double spacing and wide margins. In case the manuscript has been electronically prepared in LaTeX, please submit the LaTeX file of your paper after it is accepted. The first page of the manuscript should consist of the title, a running head of length less than 35 letters, an abstract not exceeding 150 words, 2010 Mathematics Subject Classification, key words and phrases, and full address(es) of the author(s). In case there are two or more authors, please indicate the one to whom the correspondence is directed. For the general format, the authors should consult the papers currently published in this journal. B.-Y. Chen, Total Mean Curvature and Submanifolds of Finite Type, World Scientific, Singapore, 1984. _____, Some pinching and classification theorems for minimal submanifolds, Arch. Math. 60 (1993), no. 6, 568--578. G. Mancini, I. Fabbri and K. Sandeep, Classification of solutions of acritical Hardy-Sobolev operator, J. Differential Equations 224 (2006), no. 2, 258--276. References should be cited in the text as, e.g., , [6, p. 213], or [6, Theorem 2.1]. 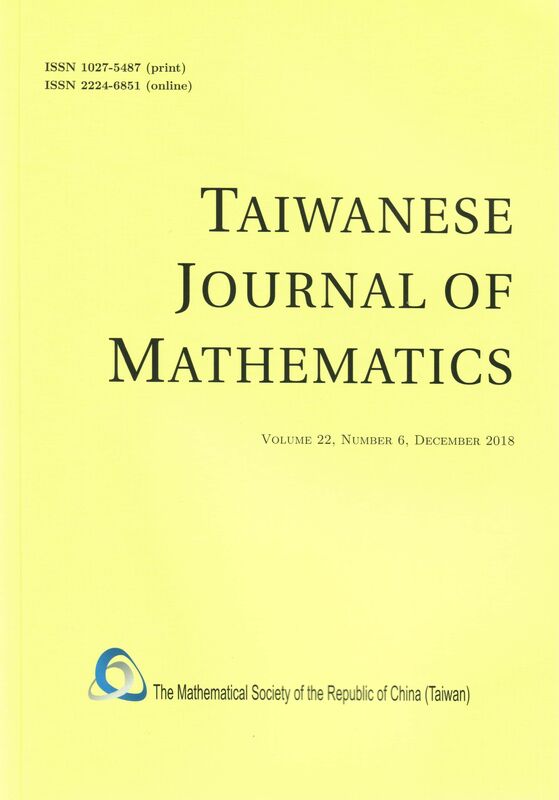 It is suggested that the theorem and page numbers be used for referencing instead of just a number representing an entire book or paper, and also that only those papers or books which are actually cited in the text be listed as references. The journal makes no page charges. Full article PDFs in all volumes are available electronically free of charge.